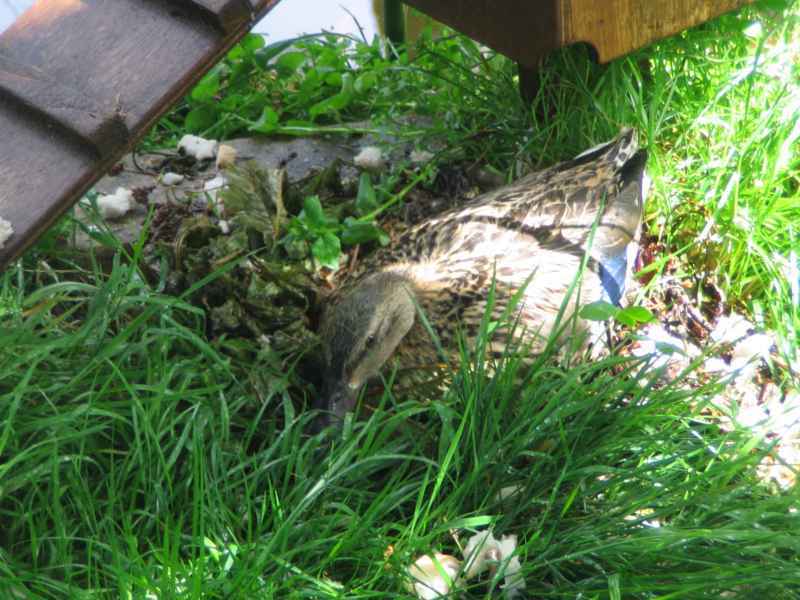 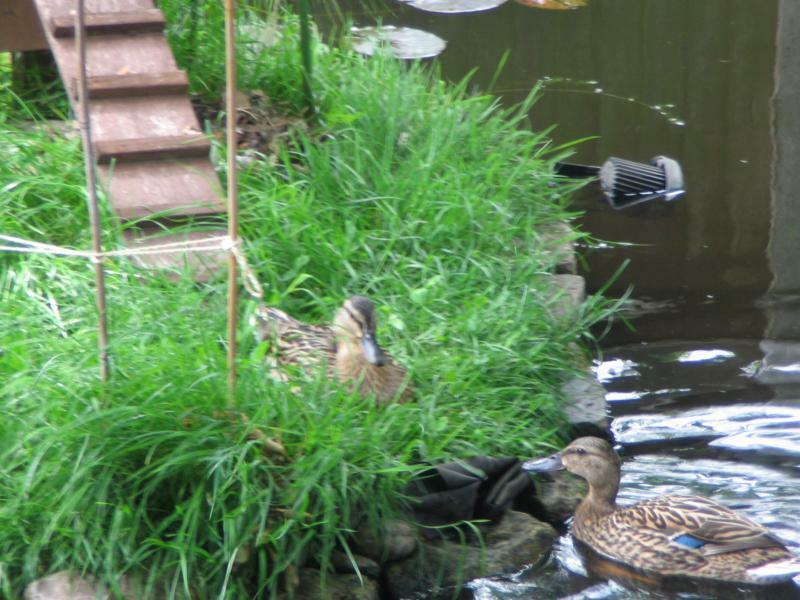 The ducks returned in 2007, built a nest (but not in the new duck nesting box), laid seven eggs and incubated them for three weeks. 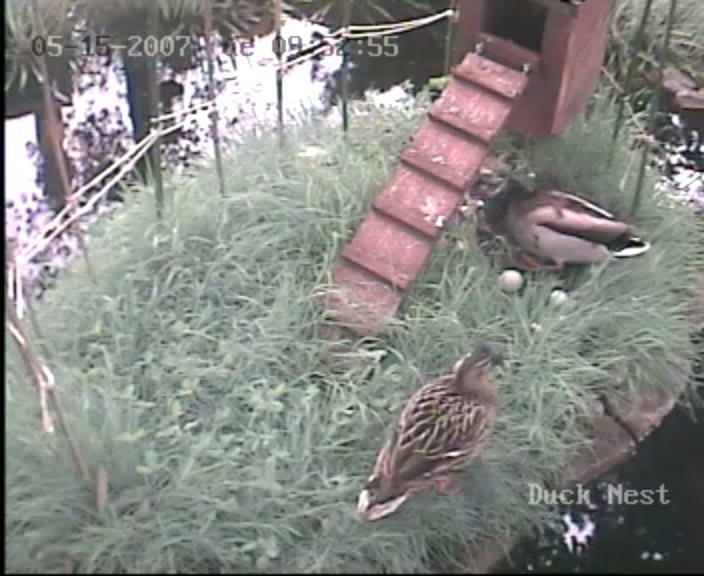 egg hatched with the duckling only surviving a short time. 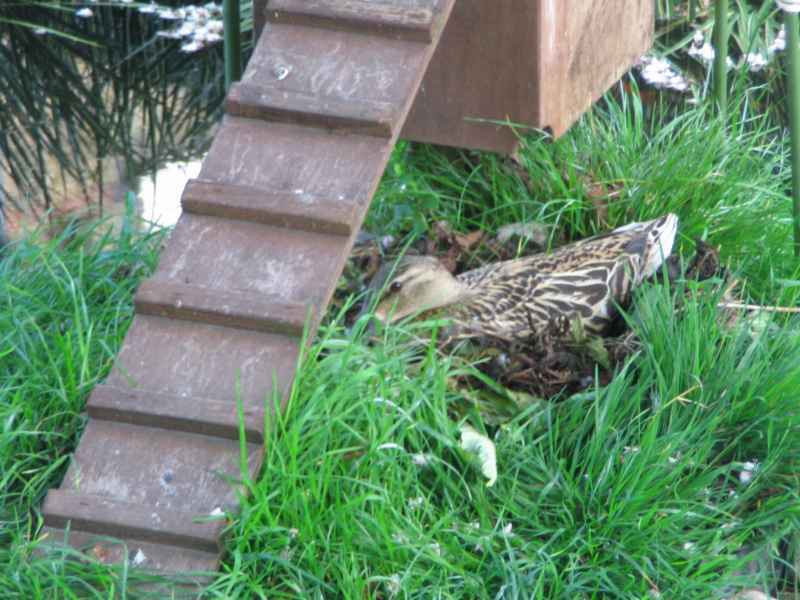 the other rogue male had been chased on the lawn. Four of the males were probably juveniles since the female tolerated them. 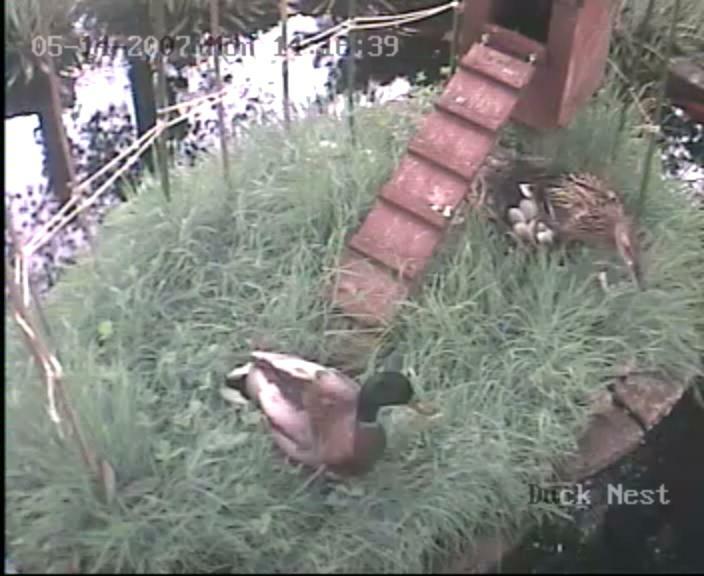 The new duck nesting box added in 2006 but never used. 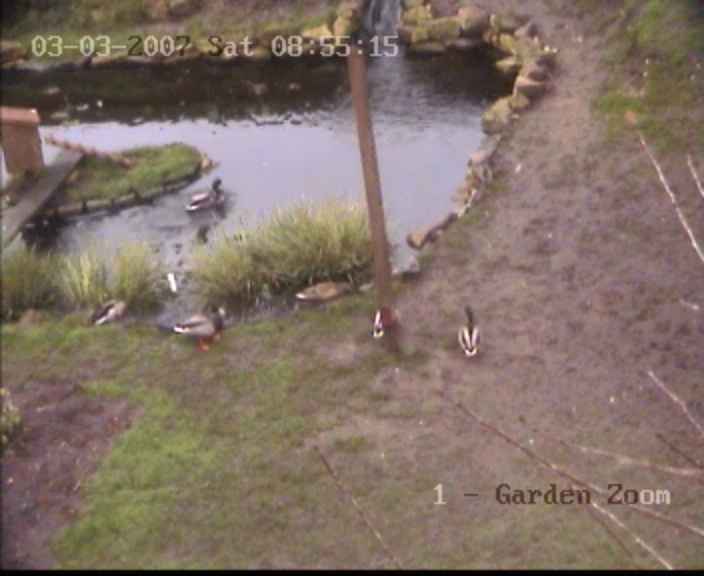 The rogue male half way down the lawn, from the CCTV camera, which was positioned to watch foxes not the pond. 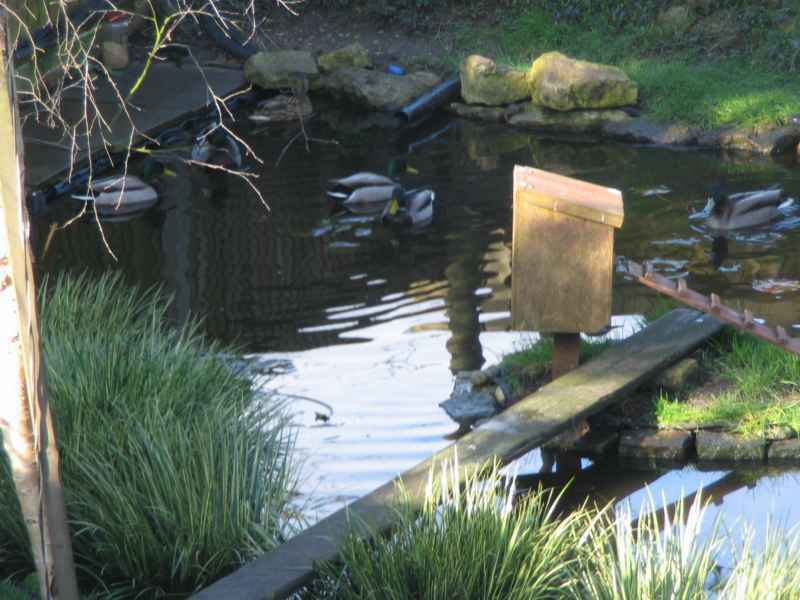 The mallards examining the new duck nesting box, and my bridge to the island, in March 2007.
the male loses interest and flies off. 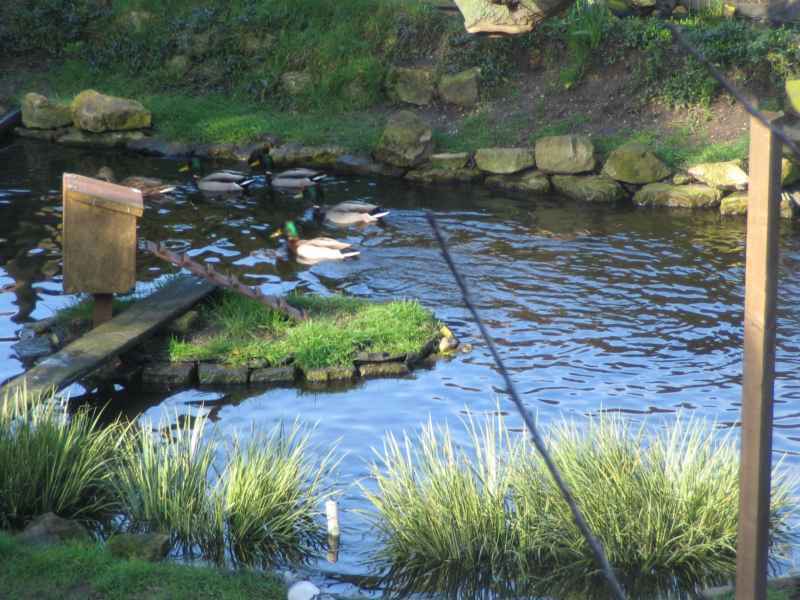 not go onto the island, so I had to remove them in the evening. 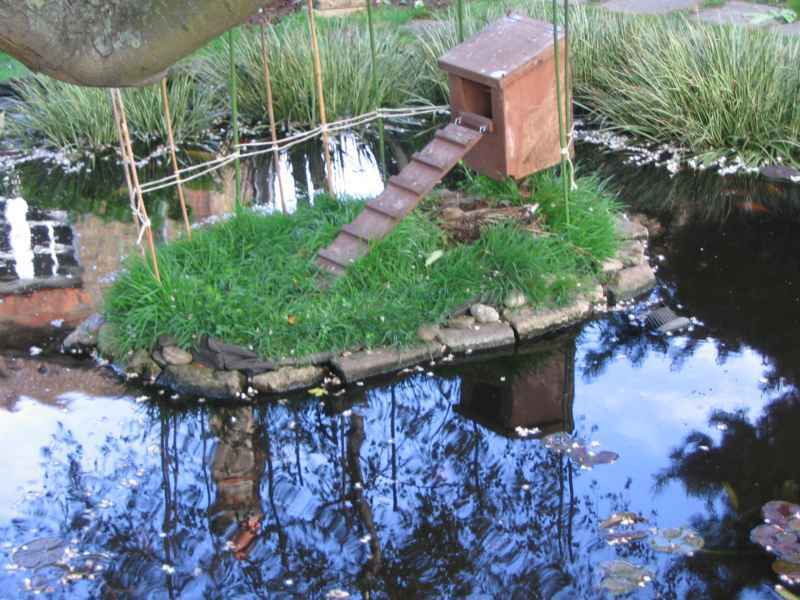 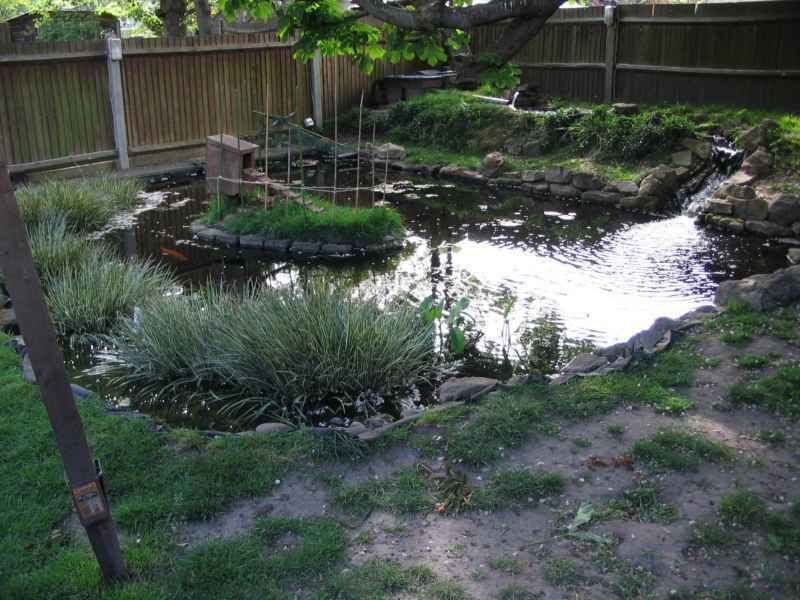 Wider view of the pond, island and nest. 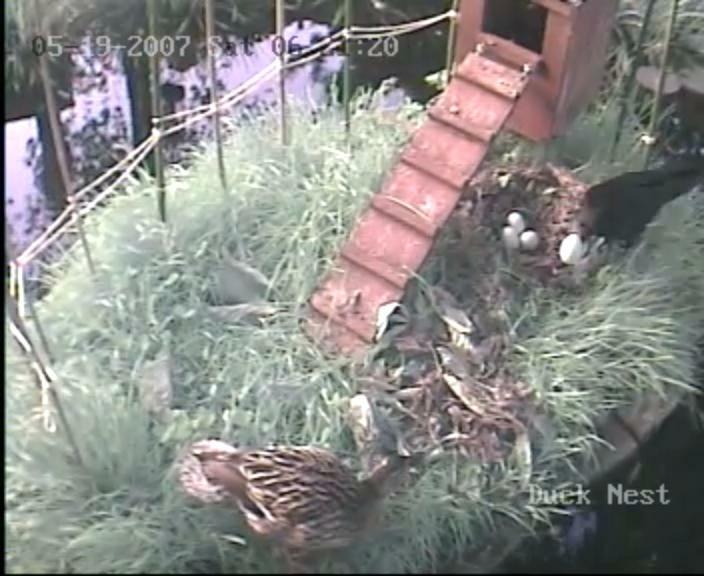 She has started to remove her feathers to allow closer contact with the eggs. 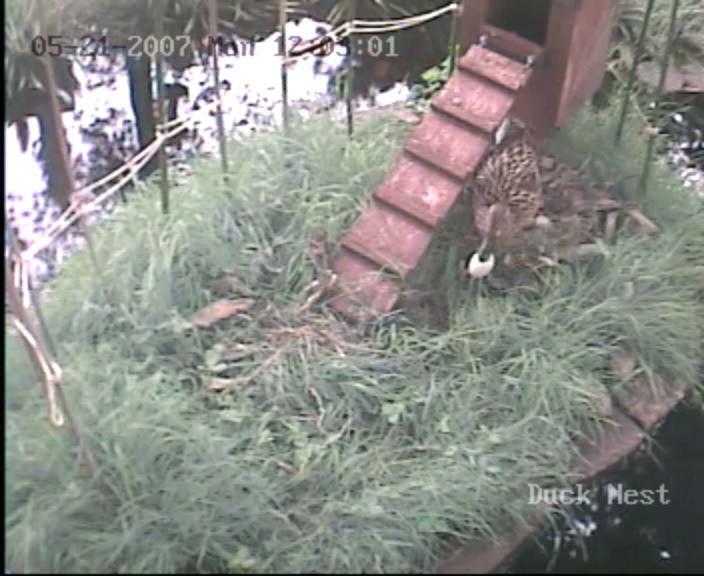 leaves onto the nest to hide the eggs, she was back at dawn. 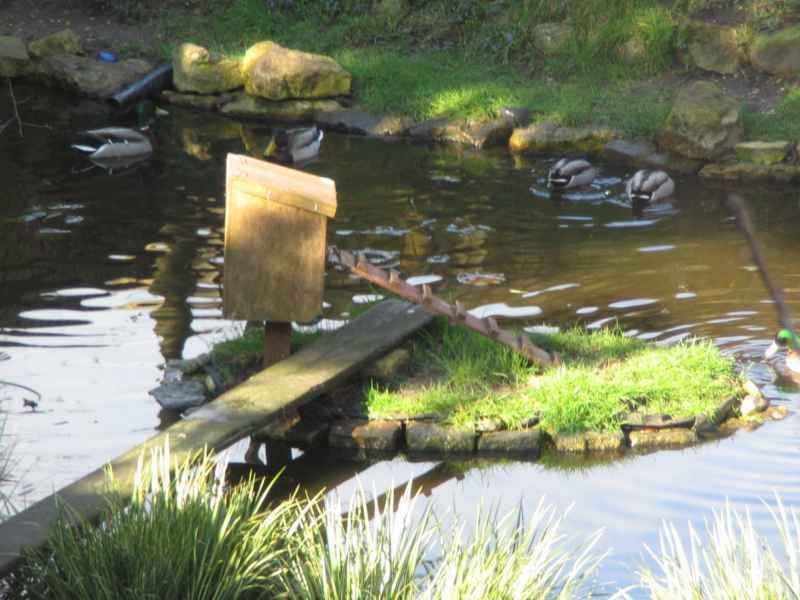 each morning just before dawn (4.50am) when the she goes for a swim and to eat duck food from a shallow shelf. 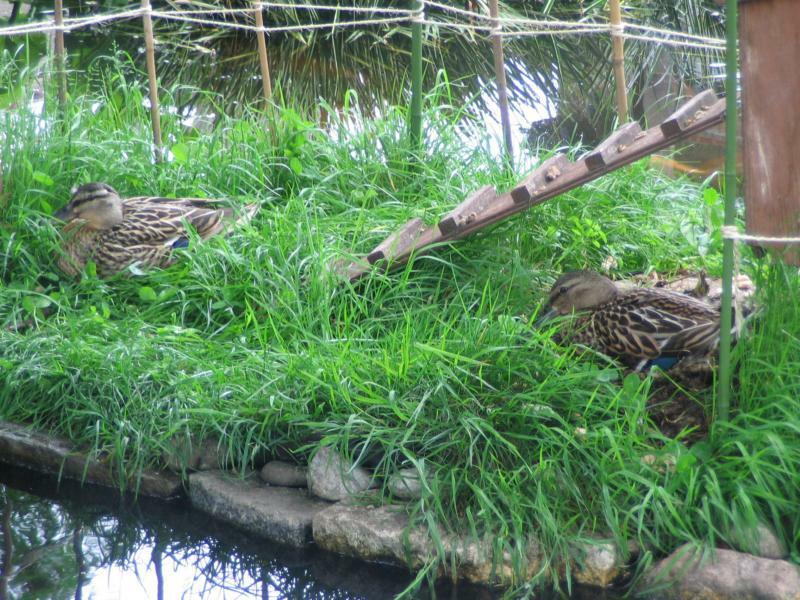 way to get proper duck food onto the island. 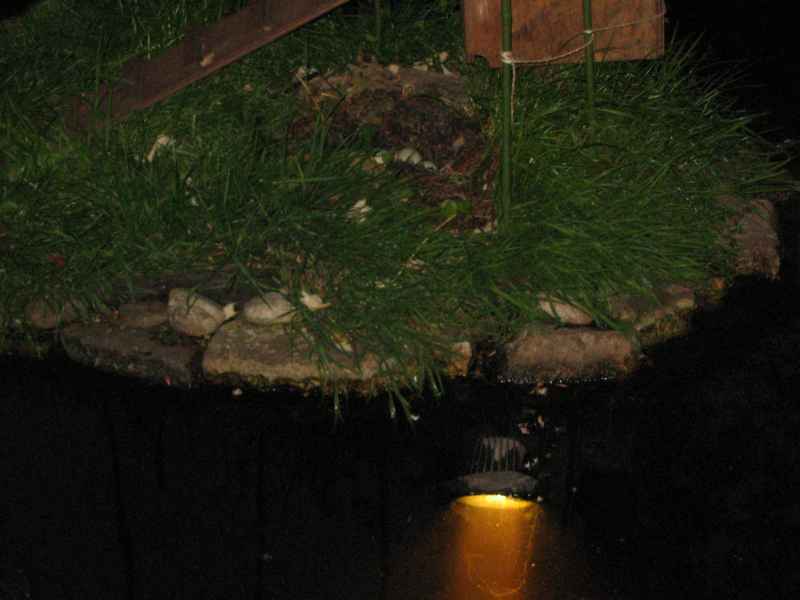 shows one of the underwater lights. 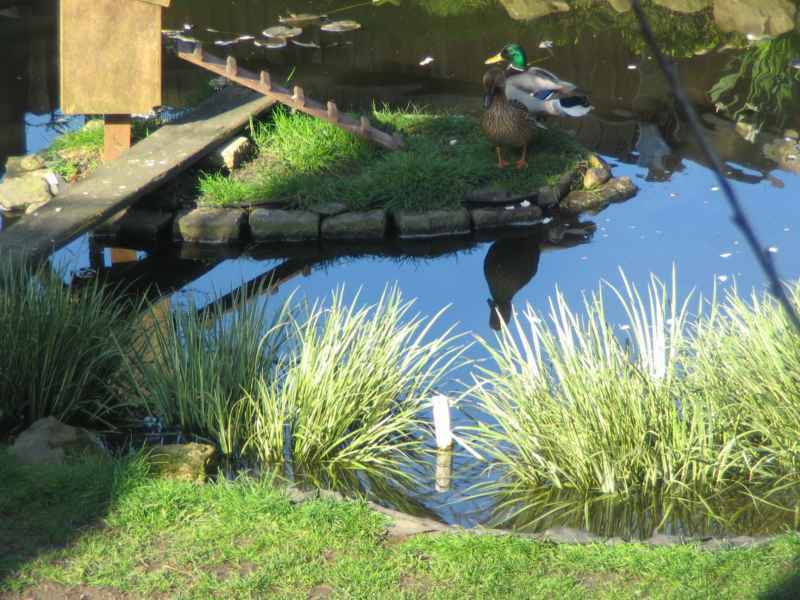 A new pair of mallards arrive in the pond, very hungry. 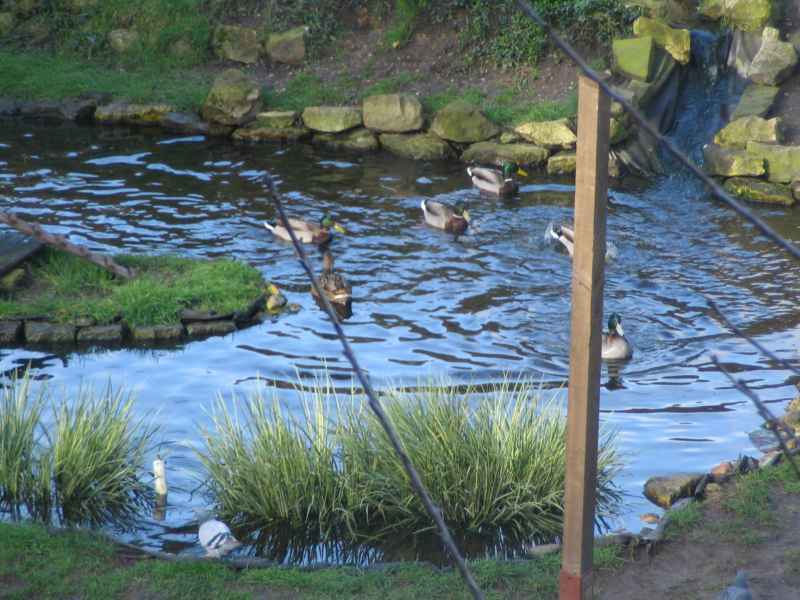 and frighten the new ducks away. 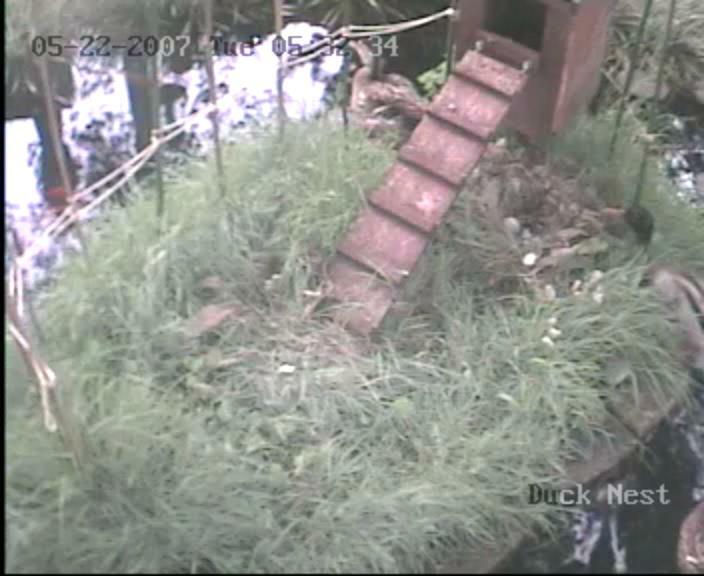 The following day the new male keeps away from the island, and the two females seem to get on together. 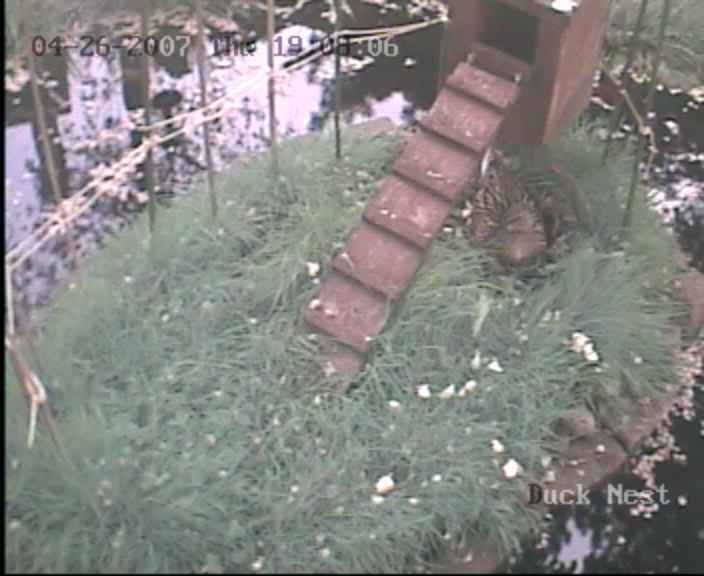 Nesting mallard on the right, visiting mallard on the left, spent most of a day sleeping quietly, and the male did not visit the island. 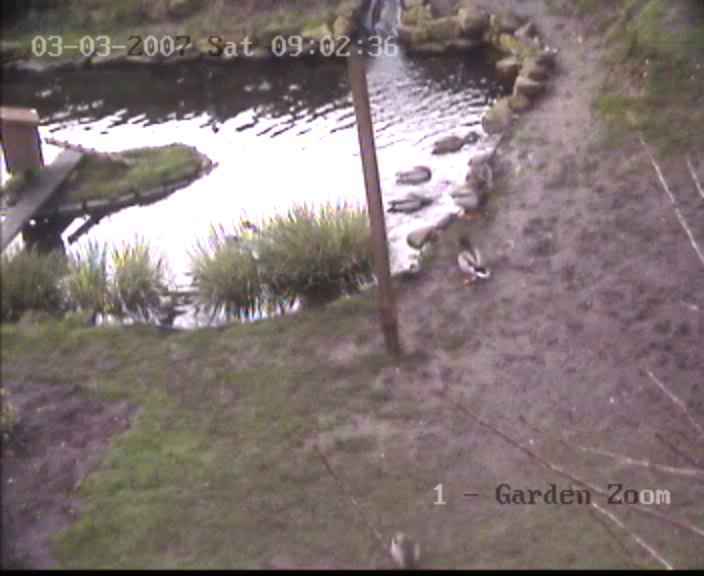 The following day the male does start looking for food on the island again. 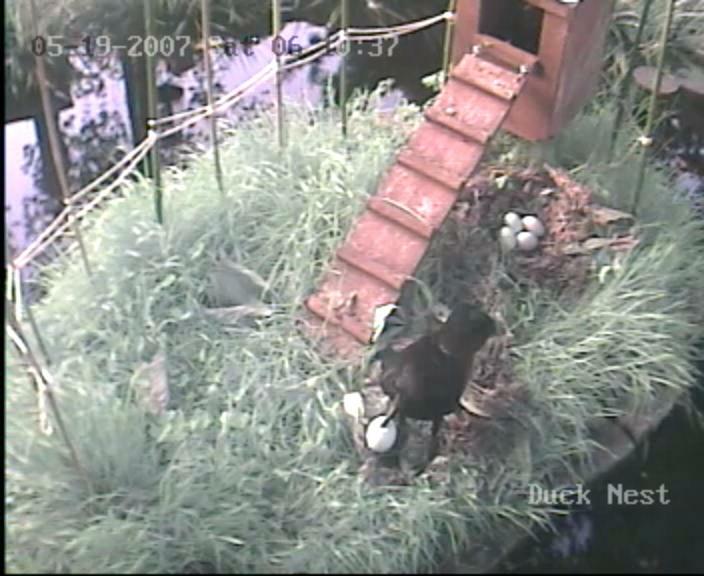 crow to steal first one egg from the nest. 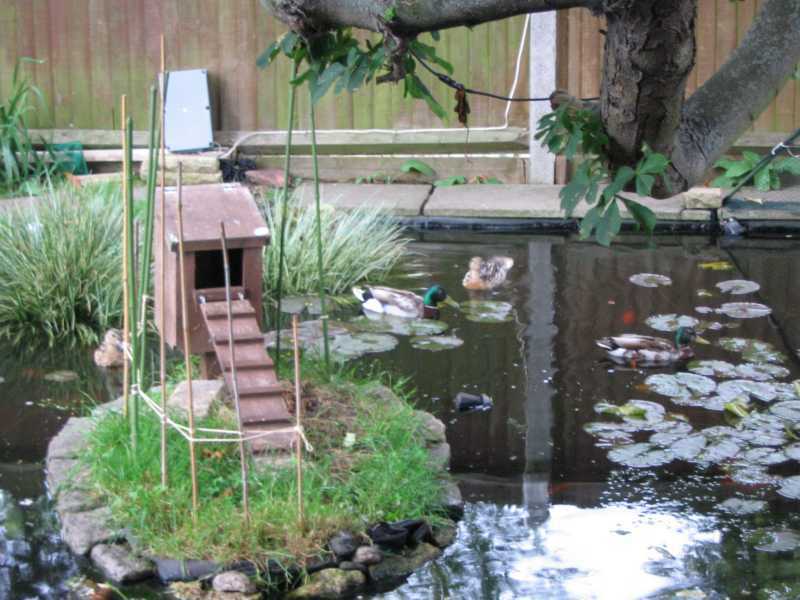 places it on a pond shelf, where the crow finds it shortly afterwards. An hour later, she cracks open the second to last egg. 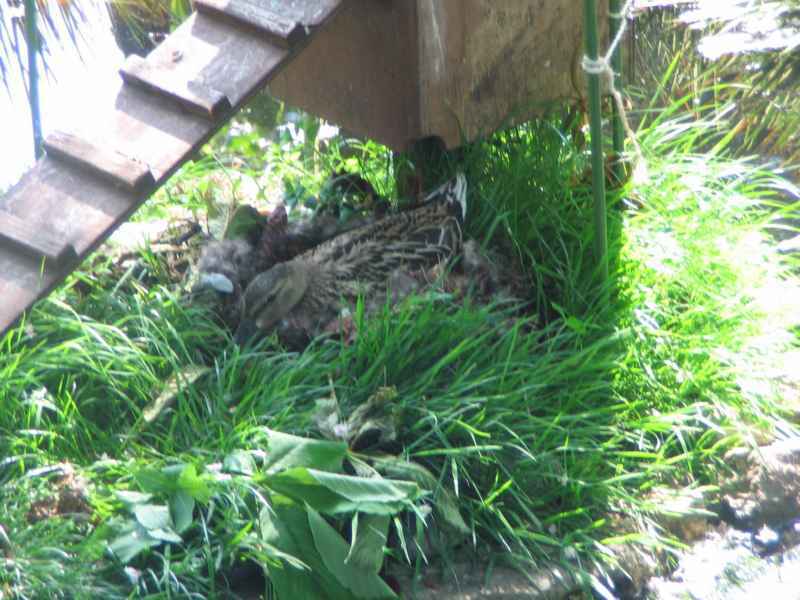 or she helped it too soon, this was the 23rd day after she started incubating. 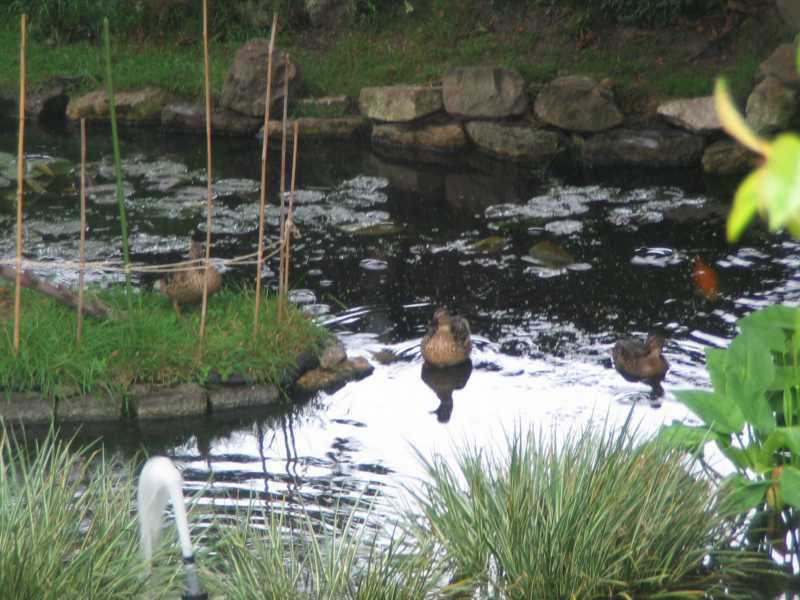 other pairs of ducks starting visiting the pond. 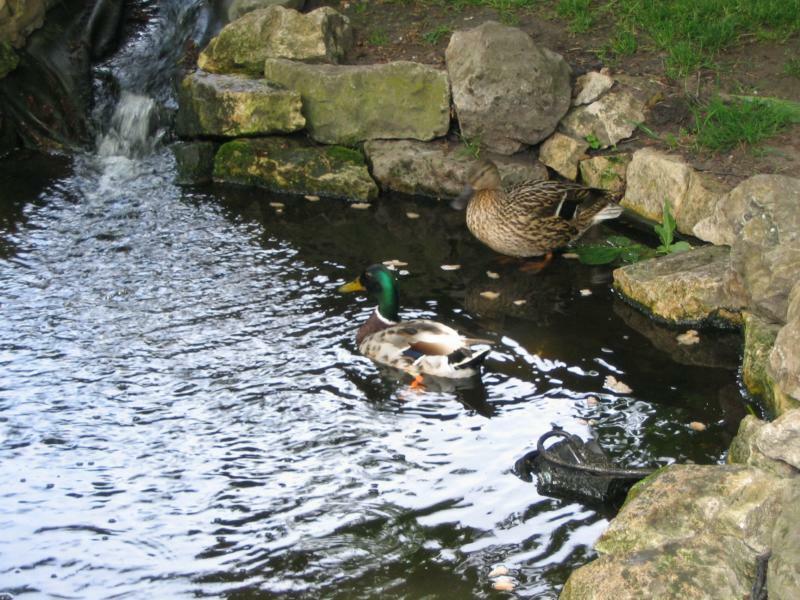 Very unusual to see two pairs of mallards together at the same time, without any fighting. 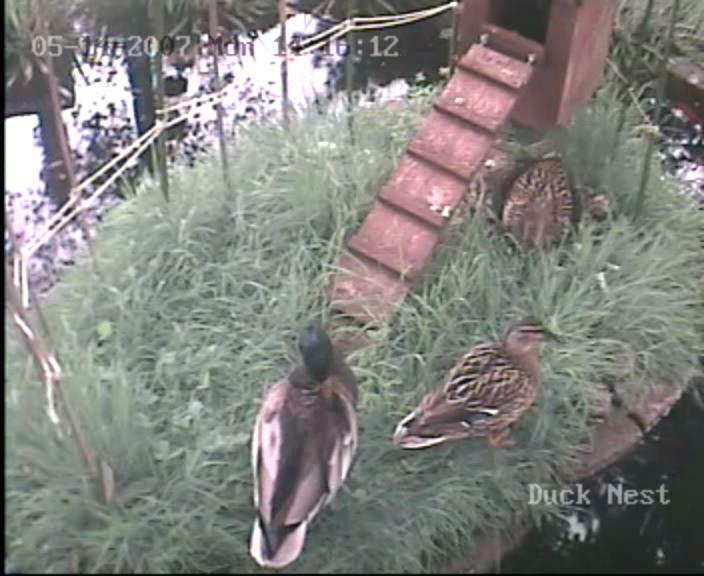 A third female mallard arrives, the first time in almost 10 years there have been three females at the same time. 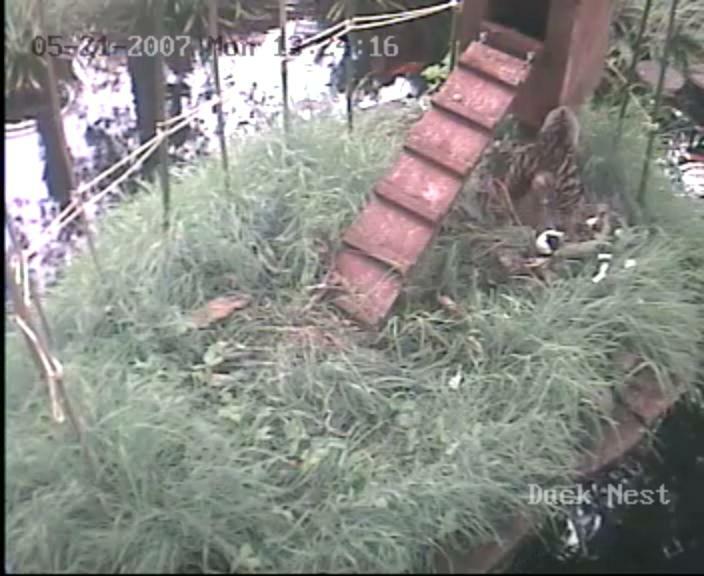 This was 18th June 2007, and duck visits ceased for the year shortly afterwards. 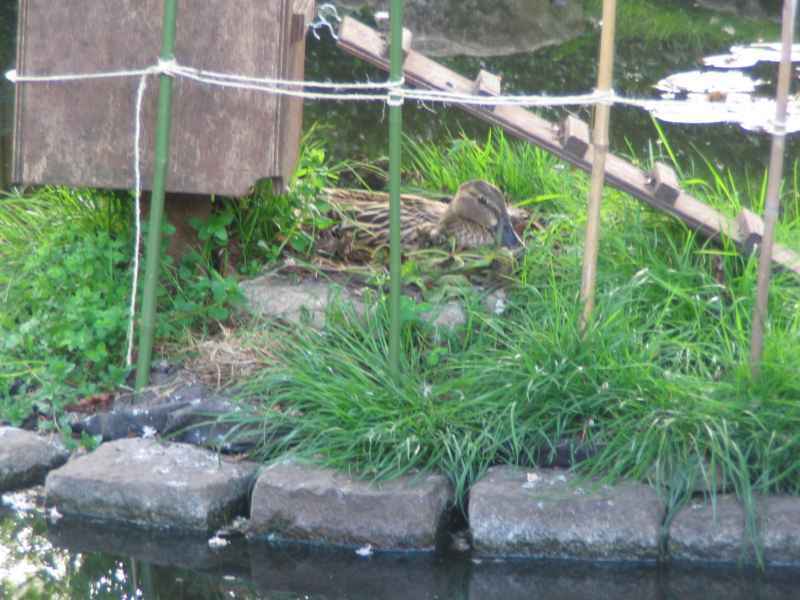 Some years visits continue into July.